28-Jul-2014 -- This was one of the few confluence points that I wasn't particularly looking forward to hiking to, because I knew (from looking at satellite imagery and reading the reports from previous visitors) that it was located in a swampy section of forest, and therefore I was sure to be ravaged by insects as I hiked to and from the point. So, before setting out on my hike, I made sure to dress in long clothing, and spread insect repellent on my remaining exposed skin: my hands and face. Unfortunately, though, I didn't wear a hat, so my hair got constantly attacked by biting flies during my hike. Nonetheless, because it was a cool, overcast and drizzly day, the insects weren't quite as bad as I'd feared. 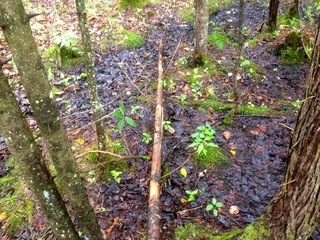 As expected, the confluence point lay in a (slightly) swampy section of forest.